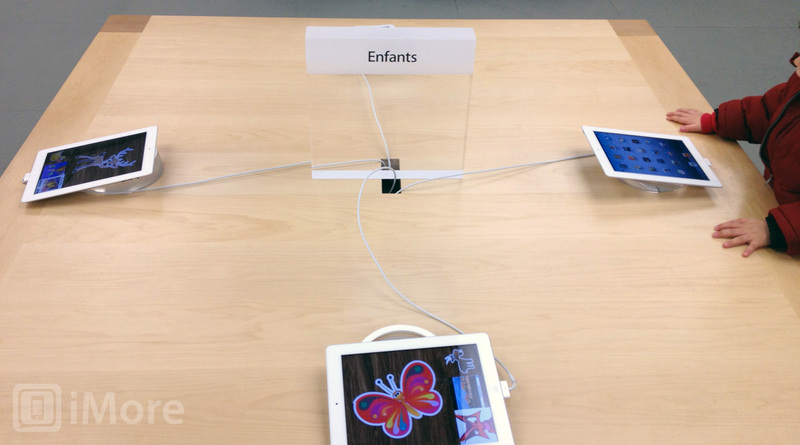 Apple Retail Stores have replaced the iMacs that traditional served as their "kid's table" with iPads. The tables, which had previously been decked out with a quartet of iMacs, now sport 4 iPads instead. Like the previous iMacs, which were set up with educational and game programs, the iPads had a variety of child-friendly apps. I'm not sure exactly when this happened, but I noticed it for the first time today when I visited my local store to pick up a repaired Mac. My 3 years godson, who was with me, took only a couple of moments to adjust. He launched a book app and began playing, just as he does at home. It was much easier for him to find an app and use the iPad than it had ever been to handle the iMac and mouse, so that was a huge win. I'll miss seeing those big screens around the kids table, but iPads are clearly Apple's future, and nothing makes that clearer than how they're deploying them for future generations of Apple customers. Apple previously replaced in-store display cards with interactive iPads, and replaced the MacBook Pro computers at the Genius Bar with iPads. Apple Store concierges also use iPads to handle appointments. There's no sign yet that they'll start replacing the actual Geniuses (or other staff) with iPads... but it can't be long now, can it?